FILE - Navy Adm. William McRaven, the next chancellor of the University of Texas System, addresses the Texas Board of Regents, Aug. 21, 2014, in Austin, Texas. The chasm between U.S. President Donald Trump and elders of the intelligence community is widening. Trump, repeating a criticism he made in a television interview the previous day, took to Twitter on Monday to again exclaim that the United States "should have captured Osama bin Laden long before we did." In the Fox News Sunday interview, the president labeled retired U.S. Navy Admiral William McRaven, the leader of the operation that killed the al-Qaida founder, "a Hillary Clinton backer and an Obama backer," referring to his 2016 Democratic Party opponent and his predecessor as president. McRaven has repeatedly criticized Trump's presidency, calling it an embarrassment and a humiliation of the United States on the world stage that has divided the country. After Trump's broadcast remarks, McRaven declared he did not back Hillary Clinton or anyone else in the previous presidential election, but said he is "a fan of President Obama and President George W. Bush, both of whom I worked for." He added that he admires all presidents, regardless of political party, "who uphold the dignity of the office and who use that office to bring the Nation together in challenging times." McRaven, a former commander of the U.S. Special Operations Command, said he stands by his comment that Trump's attack on the media "is the greatest threat to our democracy in my lifetime." 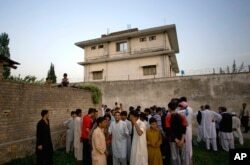 FILE - In this May 3, 2011, photo, local residents gather outside a compound where al-Qaida leader Osama bin Laden was killed by U.S. forces, in Abbottabad, Pakistan. Others with inside knowledge of the 2011 operation in Pakistan against bin Laden are coming to McRaven's defense. Former acting director of the Central Intelligence Agency Michael Morell tweeted that a correction is needed following Trump's implication that the terrorist leader should have been nabbed faster. A former director of both the CIA and the National Security Agency, retired Air Force General Michael Hayden, in reaction to Trump's attack on McRaven, taunted the president on Twitter for not capturing the current leaders of al-Qaida and the Islamic State terror group, who are in hiding. The Navy SEAL who is credited with having fired the head shot that killed bin Laden on Monday tweeted that the bin Laden mission was bipartisan. "The president is simply wrong and pushing an idea that I think is not helpful," said retired Army General Stanley McChrystal on CNN about Trump asserting previous administrations were tardy in eliminating the al-Qaida head. Trump's criticism "is symptomatic of the crisis of leadership we have today," added McChrystal, who headed the Joint Special Operations Command for five years. "This president owes Admiral McRaven and all of the SEALs involved in that operation an apology for what he's saying," said former CIA Director and ex Defense Secretary Leon Panetta on MSNBC. "He's undermining his position as Commander-in-Chief. Not only with those that conducted the operation, but with the entire military." One senator from Trump's party is also coming to McRaven's defense. In a tweet, Marco Rubio of Florida, who is a member of the Senate Intelligence Committee, expressed gratitude for the retired admiral's service. ​McRaven, who recently quit as the chancellor of the University of Texas for health reasons, has also defended former CIA Director John Brennan, another Trump critic, whose security clearance was revoked by the president. The official Twitter account of the Republican party on Monday claimed McRaven has been critical of Trump since during the 2016 presidential campaign and was reportedly on Hillary Clinton's short list as her running mate in that race — something the retired admiral and campaign officials have denied. Trump has had a contentious relationship with the U.S. intelligence community from the start of his presidency, most notably rebutting its consensus Russia attempted to influence the election on his behalf. He has also alleged a "deep state" conspiracy of shadowy figures from the intelligence community and other elements of the federal government is intent on thwarting his agenda, pursuing a "witch hunt" linking him to Moscow and leaking to the media what the president asserts is false information. Trump on Saturday countered media reports that the CIA had concluded the Saudi crown prince had ordered the killing of journalist Jamal Khashoggi, saying who is really responsible may never be known. The biggest current source of tension between the president and the U.S. intelligence community is over Saudi Crown Prince Mohammed bin Salman, according to a former senior CIA officer, Paul Pillar. "The relationship was already bad and we had already seen before this week most of the implications of that bad relationship," Pillar, a non-resident senior fellow at Georgetown University, told VOA News. Trump's denial of the CIA's conclusions about the crown prince are, by implication, "a criticism of the intelligence analysis on the subject. But the administration will have a hard time winning a battle of public perceptions on this one," according to Pillar. "The general perception," he said, "is that the implausible and ever-shifting Saudi cover stories show the Saudis are hiding something and the analysis of outside observers conforms with what reportedly is the intelligence analysis about [the crown prince's] involvement." Jeff Seldin contributed to this report.